At times, Gold can make explosive moves as yesterday, when the Fed Chairman held a speech. Fast forward to 0:32:30 minutes to hear the speech. 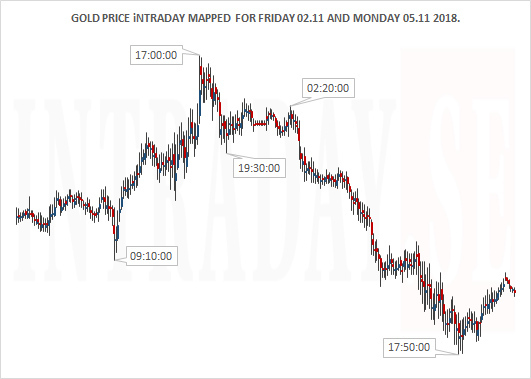 The markets knew in advance about the upcoming Powell's speech and Gold traded in a tight range in the hours leading up to the event: Then - a way to play this 'potential' explosive move, could be to place 'a stop buy order' at 1.215 one hour into the US trading session and simultaneously place 'a stop loss order' just below the 15:20 CET low or by 1/2 the daily range of USD 12,5. 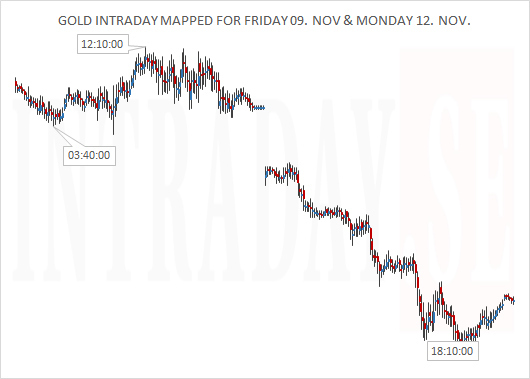 After the excecution of the 'stop buy order', the stop loss could have been trailed to entry at 1.215 or higher. Alternatively, sold out after X USD. 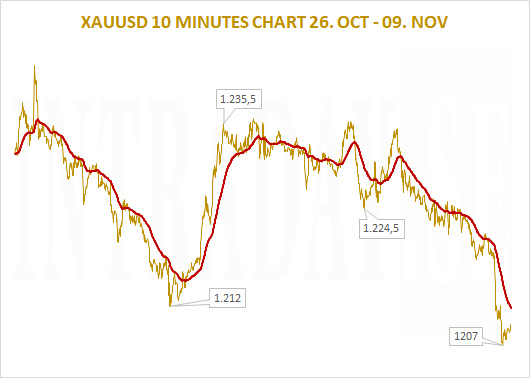 A larger one minute chart with highs and lows showing the FED Gold behaviour from 2 hours pre speech to 3 hours post the speech is at this link. Times are CET. 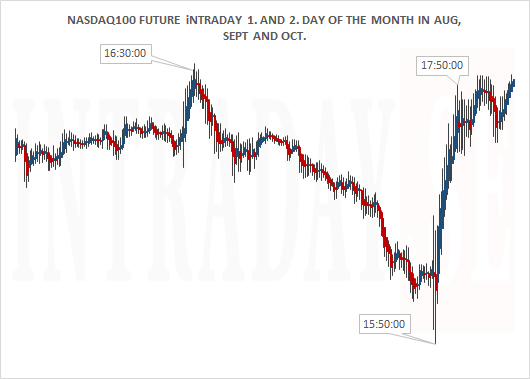 : "A top 22 minutes before the speech, thereby an explosive move to the upside without looking back. Immediate buyingpower. The strong buying lasts only 11 minutes, for there to sell off for 33 minutes. Buying comes in again lasting 29 minutes, for then to fade off over the next 56 minutes". 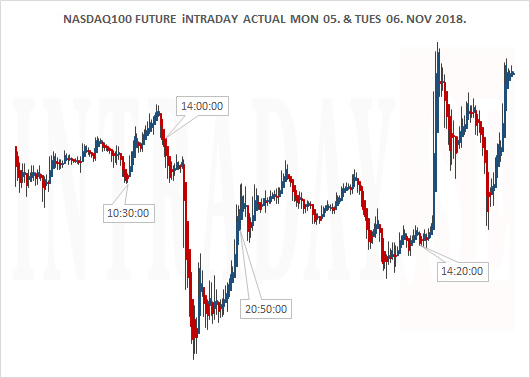 Here is tick by tick of how Gold vs Silver vs Nasdaq100 index moved parts of this intraday. 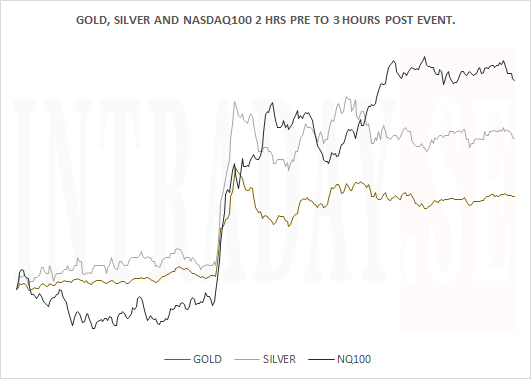 All 3 strong, but Gold most reluctant, Silver more explosive, Nasdaq100 steady strong buying. 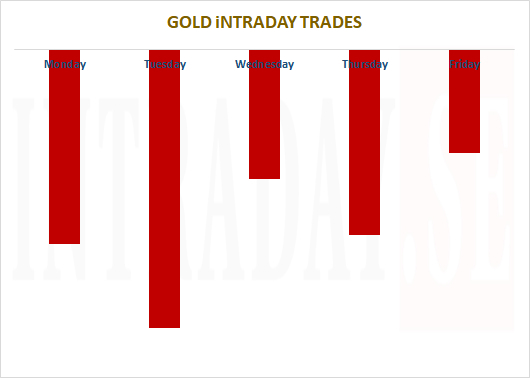 Throughout the tradingweek, research proves that the Gold market favours traders to stay short from 14:20 - 15:20 CET. 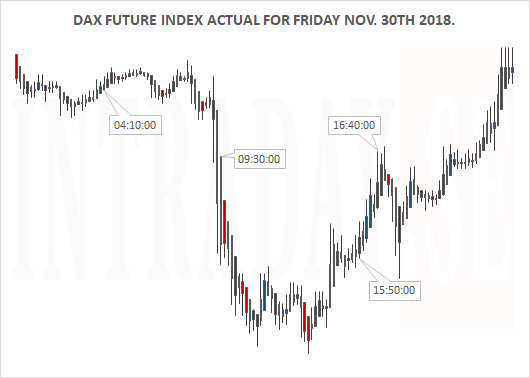 The last few weeks has changed these tradingpatterns slightly, and Wednesday has gone from showing a positive hour to a negative hour. 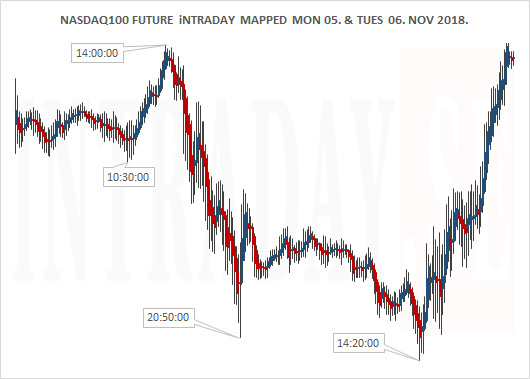 All 5 tradingdays of the week are presently in a negative territory this one trading hour. See last post here. The wild 'FED chart' above is a great example of how quickly markets may change. Remember to always keep a preferable stop loss in place. No matter the direction of the trade. Passed performance does not equal future performance. The yearly calendar starts January 1st and ends December 31st. Below is Gold's development set into a different perspective. 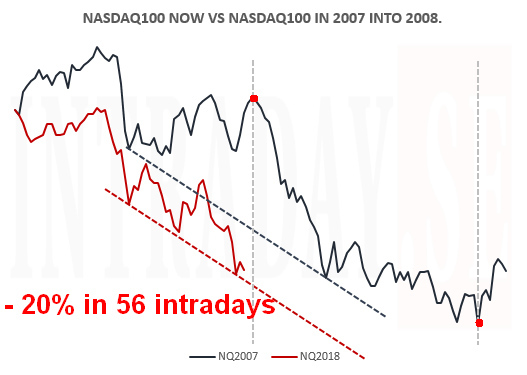 The chart shows the average two year period (in Blue) from June 2001 to June 2016 up against the latest running 2 year period (in Red) from June 2017 - June 2019. 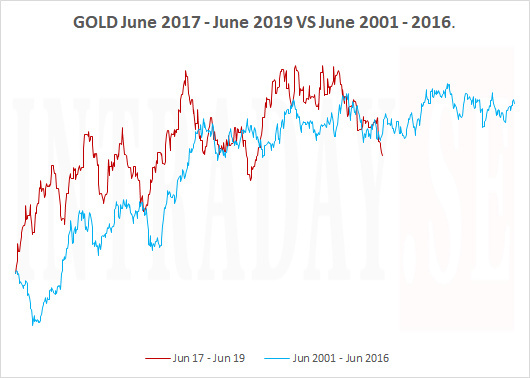 Gold markets are presently trading in a seaonally strong period until late February of 2019. Looking at the chart, there is + 6% (to 1.294) from todays price level 1.221 to the average seasonal high. 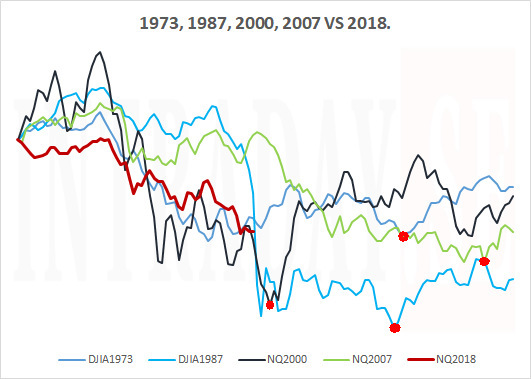 The Blue graph seems to show limited downside from here, but there are plenty of examples were seasonalities or predictions fails or act inverse. Make sure to always keep a preferred stop loss in place for all trades, long or short. Silver's next phase + 47% or - 11%? The white metal looks to face an interesting trading period over the next 3 months. Historically, the seasonal trend may be strong from now on out through February. So, could Silver manage to go against the current stockmarket trend going forward? 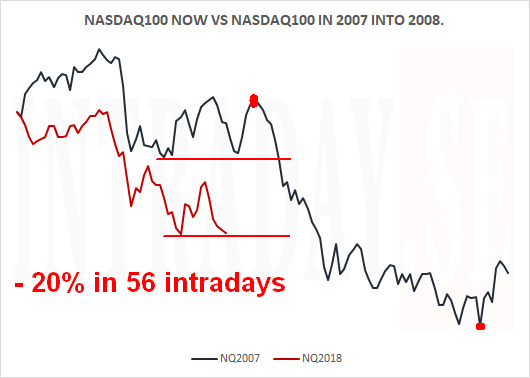 The Silver chart below (a period in 2007 into 2008), shows a strong uptrend for Silver gaining 47% where Nasdaq100 fell 22%. 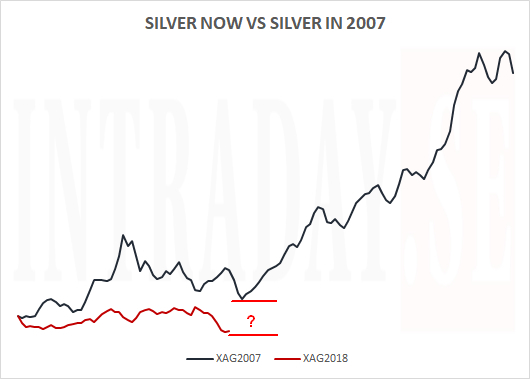 Looking at the red line (where XAG is now), you find that Silver could be turning up as soon as within this week (if 2007 is some sort of map). On the other hand, in 1987 into 1988 the Dow Jones Industrial Average fell 31% over this very same period (peak + about 100 tradingdays). At that time, Silver did not manage to stay against the stockmarket and traded down 11%. 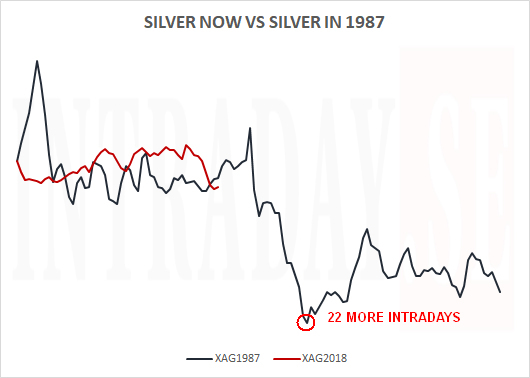 The Silverchart below outlines the Silverprice in 1987 vs today. The "22 more intradays" circle is sited from yesterday's close. 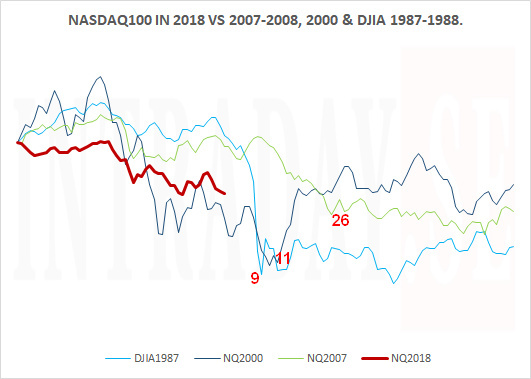 Only time will show if 2007 or 1987 really is comparable. 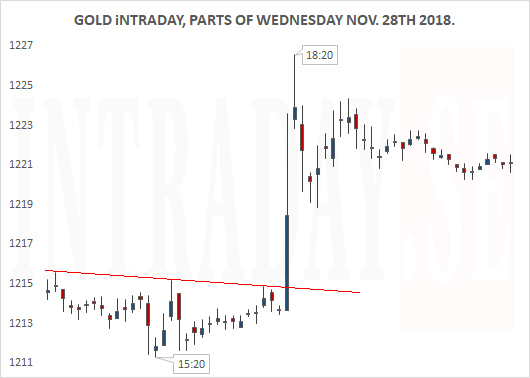 Gold was trading to the weak side the latter part of this week after having tested the 1.235 resistance level several times, but without follow-through. Gold is down USD 23, two times a daily range or - 1.9% from last Friday's close. 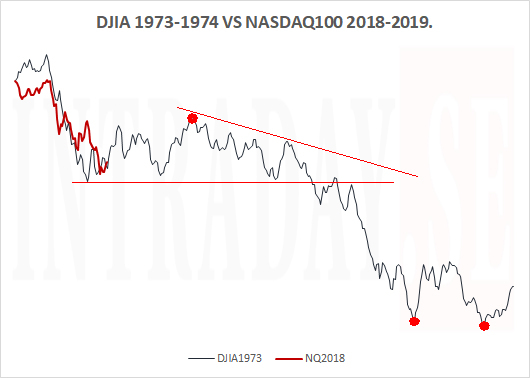 The red indicator in the chart below as a moving average, is a lagging one but could effectively benefit traders showing strength confirmation to price movements. This exponential moving average (EMA) gives more weight to the latest price data and thereby reacting faster to momentum. 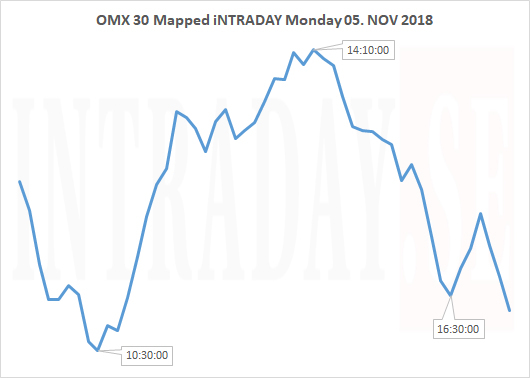 Looking into next week, the mapped intraday chart (see yesterday’s post), does not show an important timewindow until about 18:10 CET. 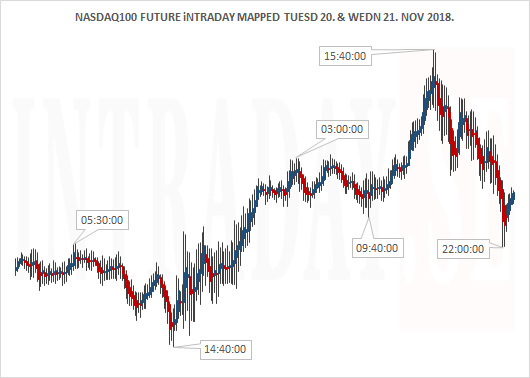 This map is based on historical intraday data, and will be interesting to see how it matches up with the red EMA indicator in the 10 minute chart below. Gold should anyhow, and soon trade back above its red line (and stay there) to proof any renewed strength. The red line stands at 1.212 as of yesterday’s close. 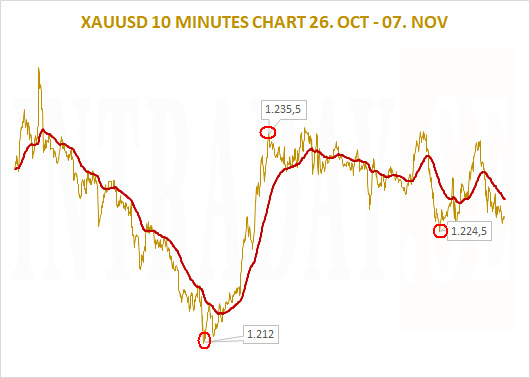 Remember to always keep a preferred stop loss in place, and the Gold's daily range. Here are golden rules. 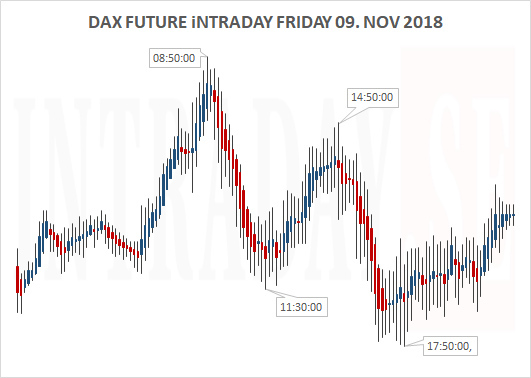 DAX FRIDAY 09. NOV 18. 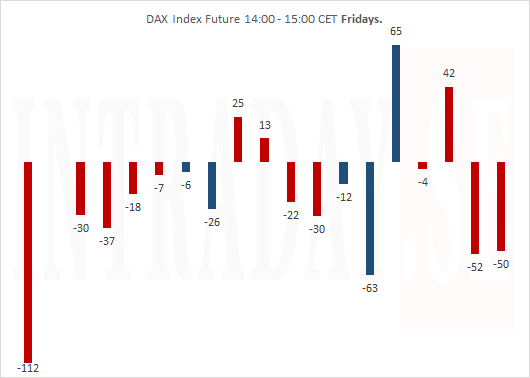 Dax Future index shows plenty of room to move the rest of the day. 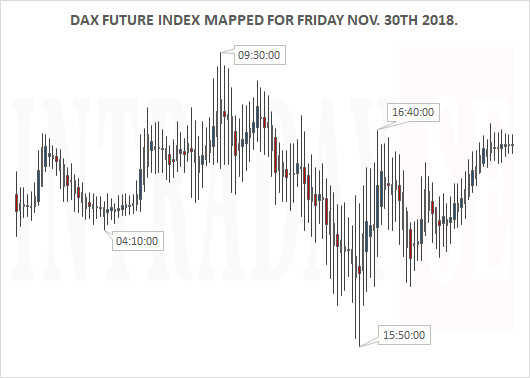 According to the intraday map below, the first upcoming timewindow around 11:30 CET could give direction to around 14:50 CET for then to switch direction until 17:50 CET. 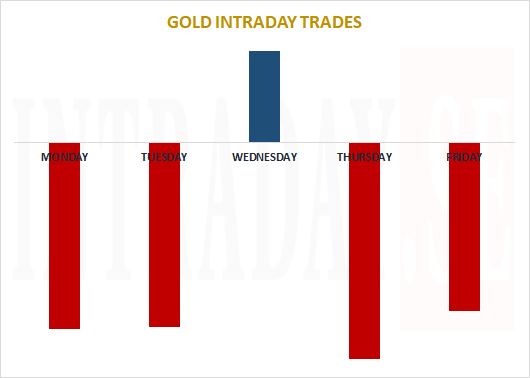 Thursday is the preferred day to go short gold from 14:20 – 15:20 CET. Wednesday is the day to stay Long, but from 14:00 CET, and to close the position at 15:00 CET. Monday, Tuesday and Friday also favours short positions from 14:20 – 15:20 CET as pointed out below. Here are the distributions of favourable outcomes. 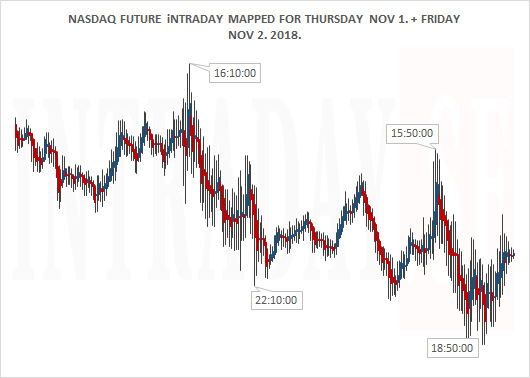 These intraday patterns seems to be persistant regardless of the entire intraday priceaction from open to close, and regardless of 'longer trends'. Always make sure to keep a relevant stop loss in place to limit losses, always remeber a daily range of an instrument, and always expect the unexpected!